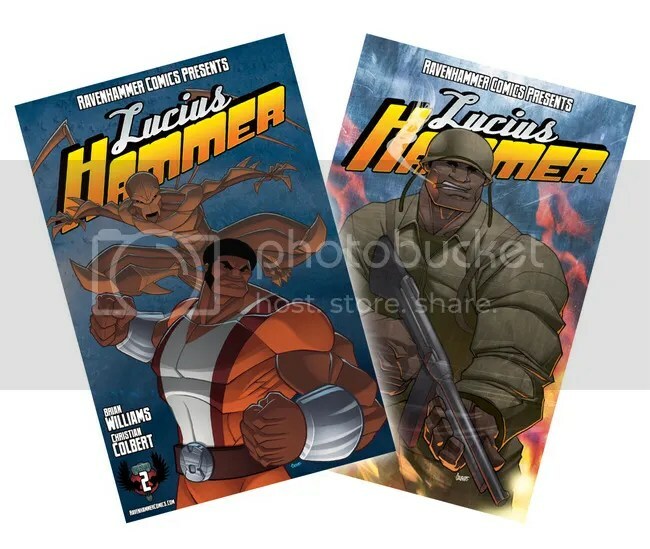 Ravenhammer Comics brings back Brian Williams to write, and Christian Colbert to draw this second issue of Lucius Hammer, telling a bit more of his “secret origin”, filling in some of the blank spots from last issue. It opens in 1944, with Lucius in the army, fighting alongside the White superhero only known as The American Way, along with regular U.S. troops they take out a squad of Nazi monstermen. Despite shaking hands afterward, and American Way telling him that he can be a hero in America when the war is over, Lucius instantly takes a disliking to him. After the war Lucius finds out that Harlem Knight has formed a group of Black superheroes called the Harlem Knights. But in the 1950’s America passed laws specifically against Black superheroes (of course) and they were all hunted down and jailed or killed, including Harlem Shadow. But then in the 60’s JFK decided to form a special team of government-sponsored Black Superheroes, called The American Guardians, and Lucius was recruited to join, and given the codename Powerhouse. The Black heroes are mostly sent to fight crime in Black neighborhoods, and one of the heroes, a spider-man-like character called Brown Recluse starts to feel frustrated, and one night he attacks and almost kills a corrupt cop, but is then shot dead by the cop’s partner. Lucius is on the scene, and devastated and angry about what happened to his friend, but isn’t sure what to do next, because the situation isn’t as black and white (no pun intended) as he thinks. This is the part I like best about Williams’ writing in this issue, he takes what could be a straightforward superhero story, but gives you a few twists that add unexpected nuance. And I love all the glimpses of other heroes, from the members of Harlem Knights to the American Guardians, which makes this feel like it’s part of larger established superhero universe, while remaining self-contained. You don’t need to have read the two Harlem Shadows issues to follow the events in Lucius Hammer (but you still should, just because Harlem Shadow is awesome). And I absolutely love Colbert’s artwork, with dynamic lines and vibrant colors. Great book. You can buy it as an ebook on either AMAZON.COM or COMICFLEAMARKET.COM (no print version available, as far as I can tell).